For religious minorities living in Pakistan, life remains increasingly precarious. In the case of Ahmadi Muslims, a minority sect in Islam deemed heretical by mainstream Muslims, this means that the mere proclamation of their identity as such is not only illegal but also unconstitutional (the Pakistani Constitution declares Ahmadis to be a non-Muslim minority). Christians have become regular targets as well, and even a simple feud (as the Asia Bibi case exemplified) can be penalised under Pakistan’s stringent blasphemy laws – which a report in 2017 by the United States Commission on International Religious Freedom puts in second spot for being the most draconian, showing a 60% deviation from international and human rights law principles. This isn’t surprising as Pakistan’s blasphemy laws provide for the death penalty for blasphemers, irrespective of whether the blasphemous words have been uttered willfully or not. The laws, which date back to 1860, were introduced by the British Government to protect the sentiments of a multi-religious fabric of Sub-Continent society. However, in post-partition Pakistan, religion played an increasingly influential role in defining the country’s political and legal landscape and religious clerics pressured political regimes to amend these laws in order to align them with so-called Islamic teachings. And when it comes to Pakistan’s religious hardliners, blasphemy is firmly on the menu of divine insanities. These radical clerics and their protégés epitomise the ugly face of vigilante justice, chanting death to blasphemers and populating their sermons with vitriol against religious minorities. They could be seen on the streets of Pakistan causing damage to life and property upon the publication of the Danish caricatures of the Prophet Muhammad and they were on the streets again this week spouting venom against the acquittal of Asia Bibi, the Christian woman on death row on allegations of blasphemy since 2010. 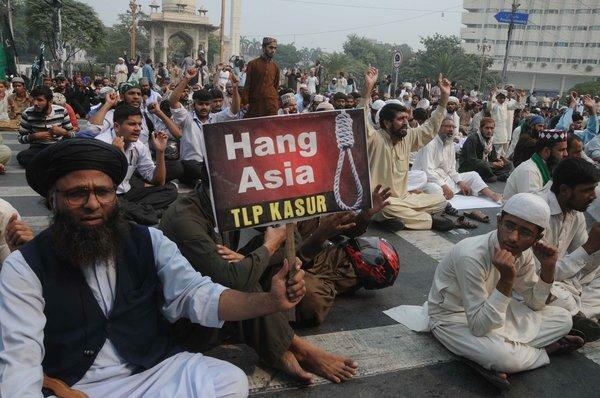 And while Asia Bibi’s release was welcomed across the world, the fatwa-giving mullahs vowed to avenge the verdict calling nation wide protests. The result was a deal brokered between themselves and the Government that effectively leaves the Supreme Court decision spineless by placing Asia Bibi on the Exit Control List preventing her from leaving Pakistan. It is as if the Chief Justice of Pakistan felt this palpable sense of foreboding as he orchestrated his arguments in favour of Asia Bibi’s release. He spends the first 14 pages of his 34-page judgment underscoring the reverential status of the Prophet Muhammad and citing references from the Holy Quran endorsing the unequivocal requirement for Muslims to hold an unparalleled and unlimited affection for him. On more than one occasion he states that no person being guilty of disrespecting the Prophet can be let off scot-free. Stunningly, the Chief Justice takes a verse of the Quran revealed in the context of the Battle of Badr and uses it to suggest that the punishment for blasphemy in Islam is death. That the apex court of the country is expounding theological arguments rather than purely dealing with the legal merits of the case lends profound insights into the ideological quagmire confronting Pakistan. It also reveals the sheer force of mob justice in the country, with the Chief Justice being compelled a day later to comment on the verdict that sparked chaos in the country, stated how the judgment was started with the Kalima and that Islam was discussed in detail. The need to appease and allay the raging sentiments of the religious clergy seemed abound. The grave irony for the radical clergy in Pakistan is that they are an antithesis of the example of the Prophet Muhammad in what was his response to blasphemy. To be sure, the Quran provides no physical punishment for the offence, the only commandment being to “turn away”. The Prophet himself was routinely labeled a “madman” and a “forger” and “a man bewitched”. Yet, he remained exemplary in his decorum and tolerance towards those who derided him, on one occasion stating that, in line with “the general thrust of his revelation and message”, he had been “charged with the obligation to forgive”. When Abdullah bin Ubayy bin Salul died, known in the history of Islam as the chief of hypocrites and who was responsible for an incident of blasphemy so serious it is recorded in the Quran, the Prophet gave his own shirt to Abdullah’s son to enshroud his father’s body for burial. He then led his funeral prayer. Pakistan’s religious clerics therefore have appointed themselves at the helm as custodians of their faith when this authority was denied to the Prophet himself, the Quran speaking of him as a mere admonisher stating, “Thou art not at all a warder over them.” This phenomenon is described well by Khaled Abou El Fadl, Professor of Law at UCLA School of Law who, quoting Sohail Hashmi writes that, “…interpretive communities do form around texts, and at times, they may hold the moral insights of the text hostage.” Importantly, what Fadl and Hashmi both underscore is that, “as Muslim intellectuals we must admit that the morality of the Qur’an exceeded the morality of its interpreters.” These words ring ominously true when radicals in Pakistan join hands to hail villains as heroes, as was the case with the assassin of the late Governor of Punjab Salman Taseer. Paradoxically, their words and their actions belittle and demean the man whose reverential and reputational status they claim to protect.